<a href="http://www.music.arts.gla lexapro 20 mg.ac.uk/muhistory/wp-content/uploads/bbcstrike1.jpg” onclick=”_gaq.push([‘_trackEvent’, ‘outbound-article’, ‘http://www.music.arts.gla.ac.uk/muhistory/wp-content/uploads/bbcstrike1.jpg’, ”]);” > Under the somewhat dramatic headline, The Massacre of the Musicians, this article by our colleague, Professor Philip Schlesinger, was published during the BBC musicians’ strike in 1980. It adroitly details the issues surrounding public service broadcasting and funding of the arts which were to become central issues for the Union under the Thatcher and Major governments spanning the period 1979-1997. It gives a contemporary account of what was a (relatively) rare musicians’ strike in the UK, especially one which had a national, rather than local, impact. At the time the BBC was the largest single employer of musicians in the UK and newspapers covered the strike prominently due to the perceived threat to the Proms, the first nineteen of which were cancelled as a result of the dispute. The Musicians’ Union strike at the BBC is now three weeks old, and an early settlement of the dispute seem unlikely. The MU’s action was sparked off by the BBC’s decision to axe five of its eleven house orchestras by the end of August. Those affected are the Scottish Symphony Orchestra, the Northern Ireland Orchestra, the Northern and Midland Radio Orchestras, and the London Studio Players. In all 172 posts will be lost – one third of the musical employment offered by the BBC. This massacre of the musicians is part of a wider package of cuts. Last February, the BBC’s Director General, Ian Trethowan, announced that the Corporation was looking for ‘economies’ of £130 million. These were to be achieved by axing the popular Radio 2 series, Waggoner’s Walk, the earlier closing down of Radio 3, contraction of regional television, cuts in schools broadcasting, and reduced funds for local radio. The BBC may also lose 1500 posts. So far, however, 158 musicians are the first to be made redundant. BBC management, which is seeking the casualisation of its musical labour force, prefers to say it is looking for greater ‘flexibility’ in the employment of musicians. Aubrey Singer, Managing Director of BBC Radio, told me that the Corporation’s light music output was ‘bedevilled by fixed orchestral groupings’. By sacking musicians, the BBC hopes to save £1.5 million. Of this £1 million is to be pent on hiring freelance players, with a net saving of £500 000. The MU, the BBC and the record companies’ licensing body, Phonographic Performance Ltd., have an agreement concerning the amount of ‘needle-time’ the Corporation may use. The limits this placed upon the use of recorded music are designed to ensure the broadcasting of live music. If the BBC reduces expenditure on musical employment by over £240 000 this entails a concomitant reduction in needle-time. John Morton, the MU’s General Secretary, argues that the BBC, by cutting £500 000 from its live music budget, is now in breech of its agreement. This is denied by Mr.Singer. The BBC says the MU is unconstructive, and, in response to widespread criticism of its present music policy, emphasises its own efforts to try and offset the loss of permanent employment by the sacked musicians. In Northern Ireland, the Corporation had begun discussions with the local Arts Council and Gallaher’s Tobacco aimed at creating a symphony orchestra by 1981 through an expansion of the Ulster Orchestra. Ex-BBC musicians are hoped to take up some of the posts. In Scotland, where the axing of Scottish Symphony Orchestra caused a furore, Stirling University has offered its facilities after discussions with the BBC. The MU sees little virtue in such palliatives, and evidently wants a return to the status quo before reopening negotiations. BBC management are regarded as unimaginative butchers without policies for light orchestral and big band music. The MU, it must be said, has so far offered no thought-out alternative. Musicians in the BBC fear the eventual disbandment of all the house orchestras. These anxieties are pooh-poohed by Aubrey Singer (currently vilified as the Dr.Beeching of Radio’) who denies that more orchestras are for the chop. However, even the firmest intentions must be doubted, given that the present cuts assume inflation at 16 per cent this year and 12 per cent the next. As it is now 20 per cent, future cuts are inevitable. The strike has, so far, enjoyed substantial support, which, given the fragmented nature of the music profession, is noteworthy enough. Since Kenny Ball and his Jazzmen sounded the last live notes on 1 June, distinguished figures such as Jack Brymer and Anthony Hopkins have refused to introduce music programmes, Paul McCartney had declined an interview, and concerts throughout Britain have been cancelled. The BBC has been condemned by the International Federation of Musicians. The MU had drawn an invidious comparison between the BBC and West Germany’s federal broadcasting service, which employs almost twice as many musicians. With moral support coming from the TUC, Equity, ACTT, and the Writers’ Guild, the most significant source of practical support has been the sympathetic action of the Association of Broadcasting Staffs. Tony Banks, ABS Assistant General Secretary, said his union would not record or transmit any live music, nor would it put out repeats of music programmes originated on the radio networks. Added help has come from some members of the T&GWU who have refused to cross the MU picket lines presently manned at all major broadcasting centres. But this has caused little serious disruption. Undoubtedly, the MU would like to see the other broadcasting unions refuse to cross the picket lines. That seems most unlikely. How long can the MU hold out? In the short term its membership is solidly behind it, although difficulties may be expected as hardship mounts. In the longer term, it faces the problem of making a public impact. The BBC can resort to increased needle-time on radio, for although this is limited to 127 hours of records a week, that is an average figure. Hence the BBC can beef up its use of records for a few months, thereby postponing the awkward silences. But the television audiences may start to get restive if programmes such as Top of the Pops, Saturday Night at the Mill; and The Old Grey Whistle Test continue to suffer disruption. One immediate source of pressure on the BBC is the scheduled start of the Proms on 18th July. The Corporation stands to lose around £200 000 in broken contracts, as well as considerable prestige, if this popular event is not mounted. As the deadline approaches, it would be surprising if talks were not to recommence. The BBC is hamstrung by its inadequate licence fee. At £34 a year for a colour TV receiver, it is the cheapest in Europe for a service unsubsidised by advertising. The BBC argues that to sustain four radio networks, local radio, and two television channels, it needs a £40 fee. However, since inflationary pressures began to grow severe in the 1960s, both Labour and Tory governments have been reluctant to provide the BBC with adequate finance. Licence fee increases are seen as vote losers, and, of course, the political leverage afforded by the Corporation’s economic uncertainty is attractive to politicians. The Corporation’s retreat from musical patronage is symptomatic of how economic exigencies have forced upon it a redefined cultural role. For its Director-General, Ian Trethowan, the ‘essence’ of public service now lies in the television service being able to match the IBA, ‘a richer competitor, who in two years’ time, will have a second, national channel’. The strategy for the 1980s envisages a BBC biased towards London, television and the delivery of mass audiences – a strategy financially dependent to a significant extent on pay-TV and the burgeoning video-cassette market. How could such a narrowing of horizons have failed to affect the BBC’s view of its musical role? Only three years ago, the Annan Committee on broadcasting eulogised the BBC for having ‘transformed Britain from a Lande hone Musik to a great centre of music making’. Last week, interviews with senior managerial figures elicited less high-flown sentiments. Stephen Hearst, head of BBC’s think-tank, said regretfully: ‘It is not our primary function to be a patron. Our primary function is to broadcast.’ And Aubrey Singer observed: ‘The time has passed when the BBC can solely underpin the musical culture of this country.’ It seems clear the present changes are irreversible. A further deterioration in public service broadcasting can only be averted if the BBC’s finances are secured. Until the licence fee is replaced with some other means of raising revenue it must be plainly increased in line with the rate of inflation. The ABS and NUJ have recently launched a public campaign to make this point under the slogan ‘Save Your BBC!’ and some BBC policy makers seem at last to have recognised the need to ‘top public’ if their institution is to survive as the premier instrument of British broadcasting. Have they waited too long? 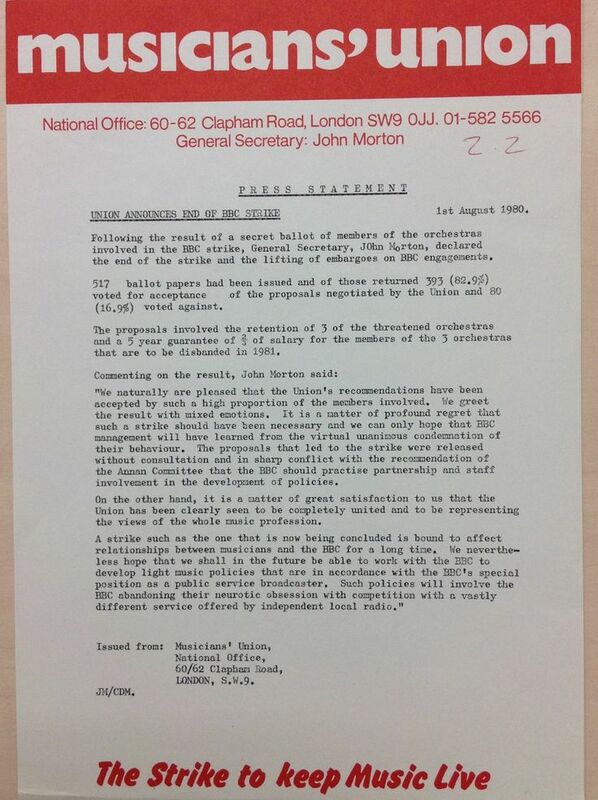 The strike ended on 1st August 1980 with a compromise agreement reached after over 30 hours of negotiations at ACAS (Advisory, Conciliation and Arbitration Service) chaired by Lord Goodman under the which was announced at a press conference and with the press release below. While considerable repetitional damage had been done to the BBC, not least the cancellation of the Proms concerts, there was also some cost to many of the musicians the musicians involved. Only three of the five threatened orchestras remained in tact, though this mitigated by delays in the disbanding of the others and compensation for those likely to be made unemployed, many of whom were also to be retained by the BBC on a freelance basis. While the outcome may not have been entirely satisfactory for the Union, it was a success in some respects, not least in showing it to be capable of organising effective and well supported industrial action in the face of unlikely odds. An article at the end of the strike in the Musician by General Secretary, John Morton, highlighted not only the strike’s importance but the large amount of support it received, under the headline, ‘The Strike That Changed History.’1 Among the success he noted were a three hour debate in the House of Commons, discussion at two Select Committees in Parliament and widespread editorial support from even traditional enemies in the press, notably The Daily Mail and the Daily Telegraph. Significantly, the strike was sustained by considerable fund raising efforts on the part of members who organised concerts as well as receiving help by way of donations from orchestras, MU branches, other trade unions and individuals. Over the course of the strike a total of £84 857 was raised and paid out to the 523 musicians in the BBC orchestras who had been on strike.